The BMC circulated its entire plan for reclamation of land along Worli Sea Face in the public domain, to reassure citizens that the project will not disturb the existing promenade. On the contrary, it will get 2.8 km longer. The blueprint includes reclamation of land for the coastal road project, construction of a new promenade adjoining the coastal road, connecting the two stretches of the promenade currently divided by Bandra-Worli Sea Link, construction of a bus terminus and a two-tiered underground parking space. The BMC’s coastal road officials said they have explained to residents that they will retain the existing promenade and construct another, 2.8 km-long one, after reclaiming the seabed. 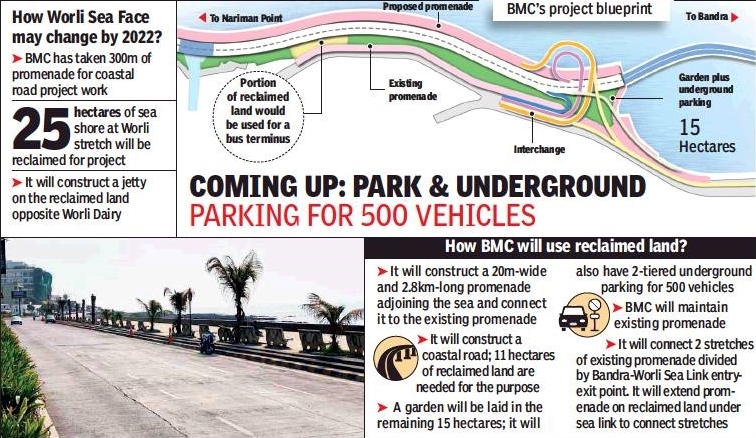 The BMC said it will connect the proposed and existing promenades and that the joint stretch will be 4.5 km long. Worli residents and Worli Walkers’ Association have planned a protest against the project at Mumbai Marathon on Sunday, though they promise it will not come in the way of the event. Last month, the BMC began to barricade around 300 meters of the south side of the promenade. Residents wanted a written assurance that the existing promenade would not be disturbed. The BMC has likewise circulated the blueprint and promised to restore the existing promenade after the coastal road work is complete and said only a portion of it will be taken up for the project. Locals are also worried about the entry and exit route of buses from the proposed bus terminus on reclaimed land. 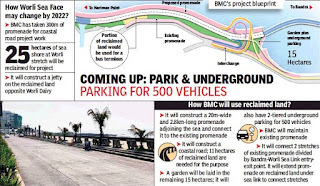 The BMC is constructing a 10 km coastal road that will start from Marine Drive and connect the Worli end of the sea link. Recently, residents held a meeting with local political representatives and BMC officials. Locals said the BMC did not explain details of the plan.